Sayadaw U Jotika’s village Sayadaw was a friend of the Okan Tawya Monastery Sayadaw in Monywa, and at the age of 12 years old, he was sent there to become a novice koyin. After Sayadaw U Jotika passed his Pathamaji levels of Dhamma studies at Okan Tawya Monastery, he was ready to study his next level of Dhamma theory studies, Dhammachariya levels. He wished to do study in a quiet place in order to be able to memorize and achieve well on his Dhammachariya exams. Sayadaw U Jotika’s Grandparents had been vihara darika (Monestary building donators) of a small village monastery in Yankin Hill in Mandalay called Oo Yin Monestary. So Sayadaw asked his grandmother, who lived at Oo Yin Monestary whether he could come and stay at oo Yin for the duration of his exam preparation time. in what is now the Upekkha Parami Monastery building, and it is now more than 50 years old. 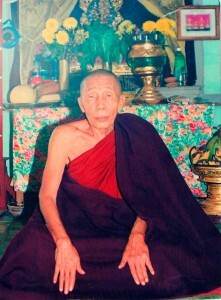 Sayadaw U Kusala, the great teacher of Oo Yin Monastery who passed on the monastery onto Sayadaw U Jotika. Sayadaw’s efforts to study for his Dhammacariya exams paid off, and at the age of 26, he graduated his exams. U Kusala was a great teacher for Sayadaw U Jotika. U Kusula also held responsibilities of being the Chairman of Yankin Hill Council, as well as the Chairman for the entire Patheingyi townships (samghanayaka comittee). After the completion of his Dhammachariya academia levels, U Jotika made plans to return to his hometown monestary in Monywa, Okan Tawya Monestary. The great teacher of Oo Yin Monastery, U Kusala explained to Sayadaw U Jotika, that as this monastery had been donated by Sayadaw’s grandparents, U Kusala had chanda, a wish to convert his current small monastery, into a Dhamma theory & studying monastery, a Pariyatti monastery. As U Kusala felt he had no other disciple who seemed suitable to take over to become the new head of Oo Yin Monestary, he proposed this offer to Sayadaw U Jotika. He said that this monastery may certainly be a possible success to workout for Sayadaw. Initially, when U Kusala first made this offer of the monestary to U Jotika, he did not accept it in the beginning, as he had another Sayadaw Teacher, U Nandobhasa of Okan Tawya Monestary in Monywa. U Jotika felt he had to pay loyalty to continue being U Nandobhasa’s disciple at Okan Tawya. Sayadaw U Nandobhasa was U Jotika’s uppajjhachariya, the bhikkhu who was responsible for his ordination. U Kusala really strongly wished for U Jotika to take over his monastery. So U Jotika went back to Monywa, but he felt very afraid, to approach his teacher, U Nandobhasa as he was not certain of his teacher’s response. 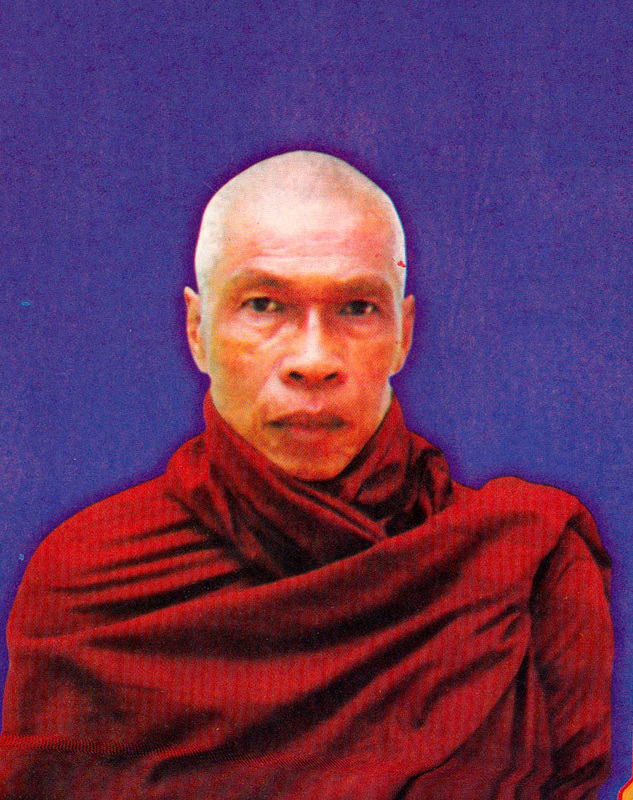 Sayadaw U Nandobhasa, Sayadaw U Jotika’s ordination teacher, of Okan Tawya Monastery in Monywa, where Sayadaw had lived since he was 12 years old. hoped to pass on Okan Tawya Monastery onto U Jotika. Knowing both Sayadaws, at Oo Yin and Okan Tawya both had future aspirations for Sayadaw, he felt he was in a challenging situation. But he knew he had to tell U Nandobhasa, the wishes of U Kusala, as he knew the great teacher would be approaching Monywa with the request. So U Jotika decided to approach the U Nandobhasa one day underneath a tree, in the presence of 5 other Bhikkhus and passed on the request from U Kusala, and how he wished Sayadaw to become the Head Bhikkhu of Oo Yin Monestary, and to turn it into a great study, Pariyatti Monestary. After U Jotika approached his teacher, U Nandobhasa and expressed the request, he saw his teacher’s face expression change, becoming angry and sharp. U Nandobhasa remarked, ” You may do what you want!” and extended his arm in an outward gesture, as if to get rid of U Jotika. And then his teacher said not a word and and became silent. U Jotika grew silent, and did not know what to say. At that time, more than 25 years ago, the main road up to the area around Yankin Hill Mountain stopped at a certain point, much shorter to what it is today. The rest of the village area was only accessible by ox and cart. This is how Sayadaw would sometimes get to Oo Yin Monastery whilst he was studying for his Dhammacariya. The Assistant Bhikkhu continued to ask, “How about you, do you think this can be a possible? A Pariyatti Monastery in Yankin Hill? As soon as Sayadaw’s teacher, U Nandobhasa heard this answer, his face expression and mind appeared to change immediately. His teacher’s mind filled with wholesomeness and the dosa anger seemed to dissipate and be replaced with only loving kindness metta. After this, all flowed in harmony. After the Wasso Rains Retreat period, and the following Kathina robes-offering ceremony Sayadaw U Kusala came to Monywa. When Oo Yin Sayadaw, U Kusala comes to Monywa, I shall tell him, “Bhante, please don’t give me your monastery, please give your monastery to my teacher, Sayadaw U Nandobhasa. As Sayadaw U Nandobhasa has many senior disciples , should he recommend a different senior monk, then this monk may take over Oo Yin. Altho taking charge of Oo Yin Monastery was important to Sayaadw U Jotika, he also thought to keep in good relation with U Nandobhasa, his teacher, he thought it would be the best idea Oo Yin be passed onto him. And then U Nandobhasa could decide as he liked. On arrival, when U Kusala was told of Sayadaw U Jotika’s idea of passing on Oo Yin Monestary to U Nandobhasa, he was overjoyed and very happy at this suggestion. U Kusala replied, “Yes, I will do as you say.” He told Monywa Sayadaw, “I will give all my monastery to you. I want to develop a Dhamma theory study (Pariyatti Sar Thin Taik) monestary, please help me. You may give me the teachers as you would like. The Monywa Sayadaw, U Nandobhasa replied, ” Yes Sayaadw, I know about this as U Jotika has explained this to me. I will not give you other teachers, I will give you U Jotika….. Indeed, I do not want to give you U Jotika. U Jotika had started in Monywa as a 12 year old koyin Novice, and I have loved him as a son and taught him, educated him and looked after him from a very young age, thus I do not want to give you U Jotika….. But to develop the Budddha Sasana, I will give you help to develop your monestary into a pariyatti monestary. The following year, in 1990, Oo Yin Pariyatti Sar Thin Taik Monastery was officially opened in Yankin Hill, as Sayadaw U Jotika as the new head monk. When Sayadaw opened Oo Yin Pariyatti Pariyatti Sar Thin Taik Monastery. 12 novices from Monywa, Okan Tawya moved with him, to help the new monestary to begin its first steps of development. Even from the very beginning, Sayadaw emphasized on the importance of learning the English language and relevant subjects as well as all the Tipitaka and Pali and other Dhamma teachings in Burmese. This concept of teaching and studying English in a monastery more than 25 years ago, during the era of very government controlled military regime, it would have been a very opposed choice to make. Ever since the very early days, Sayadaw has been a pioneer in pursuing and following up of many ideas and concepts, daring for any burmese to even consider, including the bold vision of english education available for everyone, the equal treatment and opportunities given to sayalays and monks. For the future, at the Global Peace University, Sayaadw U Jotika has the idea surrounding the teaching of interfaith or religious harmony subjects, between all buddhists, muslims, christian, hindu and other religious groups. The old Oo Yin teacher, U Kusala continued to stay with Sayadaw at Oo Yin Pariyatti Monastery for one year. U Kusala told Sayadaw, “After I give you the monastery, I will go to the top of Yankin Hill mountain and there I shall live alone ekasari and will practise meditation until my last days. U Kusala lived there alone on top of Yankin Hill in a small monastery abode called vaso which had been built for him, and lived there for 10 years. He passed away in 2000 at the age of 76 years old. Before U Kusala passed away, Daw Aung San Suu Kyi paid a visit to Oo Yin Pariyatti Monestary. One of the first standing buildings, Metta Parami building in restoration thirty years ago. Sayadaw (centre) at a young age in Monywa. The first classroom which was used, 25 years ago. The old Oo Yin Sayadaw, Sayadaw U Kusala, with some devotees.